Coretta Scott King started the Martin Luther King Jr. Center for Nonviolent Social Change in the basement of the couple's home in the year following King's 1968 assassination. In 1981, the center was moved into a multimillion dollar facility on Auburn Avenue, near King's birth home and next to Ebenezer Baptist Church, where he preached from 1960 until his death. In 1977, a memorial tomb was dedicated, and the remains of Martin Luther King Jr. were moved from South View Cemetery to the plaza that is nestled between the center and the church. 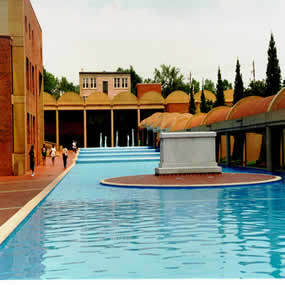 Martin Luther King Jr.'s gravesite and a reflecting pool are also located next to Freedom Hall. 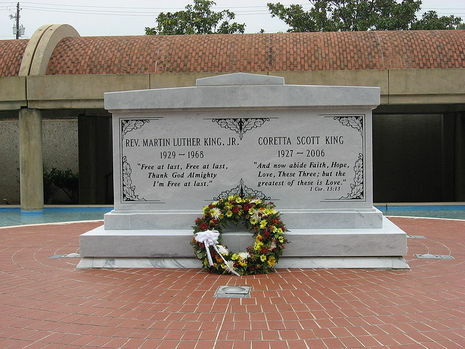 Mrs. King was interred with her husband on February 7, 2006. As of 2006, the King Center is a privately owned inholding within the authorized boundaries of the national historic site. However, there is debate within the King family on whether it should remain so or be sold to the National Park Service. In the 1970s Coretta King established and chaired the Martin Luther King Jr. Memorial Center for Nonviolent Social Change in Atlanta. This project took her around the world in search of financial support, lecturing to audiences numbering in the hundreds. The King Center, which was dedicated on Auburn Avenue in Atlanta in 1981, contains more than 1 million documents related to the King family's civil rights activities. Several thousand scholars have used its library resources since it was established, but in the 1990s Coretta King and her family came under fire for the way she tightly controlled her husband's legacy, including his image and papers. She was also involved in a feud with the National Park Service over their handling of the King property on Auburn Avenue.